Miss Directions: The Full Story. I'm sorry this has taken me so long to write, but here you go, the full story behind my 'secret'. I apologise if it's too long for you to care to read it, there are some outfit and food pictures at the end so just scroll on through. I should probably give you some background first, hard when I don't want to give too much detail away on where I work, so lets just call it Company. Now Company has a head office in Melbourne, plus regional offices in all the capital cities. I work in the regional office in Melbourne (which is only a few hundred metres from the Head Office). My position in Company is known as Job and above me there is Senior Job and Manager Job. Okay, so about six weeks ago it was announced that the guy in Senior Job in my office was moving to a different position in Head Office, this means we'd be getting a new Senior Job at some point. I didn't think much of it and wished him well, I think he'll do great things over there. It was also announced that the gentleman in the Manager Job in Queensland/Brisbane had left and a replacement was being sought. Again, I didn't think much of it. These jobs were going to be advertised with some brand new ones as part of an expansion in Head Office shortly. Now at the same time, SJ has still been struggling to get a job in Melbourne. He's not really enjoying being a bike courier (I'm not sure many would!) or the minimum wage he is earning. He mentioned only that week that he was ready to move back to Brisbane to investigate opportunities he may find there. Plus he misses the support network of family and friends we have up there. So after telling SJ about the upcoming changes, he asked me to keep an eye out for positions in Brisbane. There was every chance that the Manager Job could be filled internally and people would shift up positions making room for me somewhere in the future. I promised I would apply if anything came up. The very next day (this all happened from Monday to Wednesday in one week!) a whole bunch of positions were advertised. I didn't even check them out, I was that uninterested. However, a colleague of mine brought them to my attention...in Queensland the Manager Job was being advertised, in addition to a Senior Job and a Job (just like mine down here). This was a major deal for me. 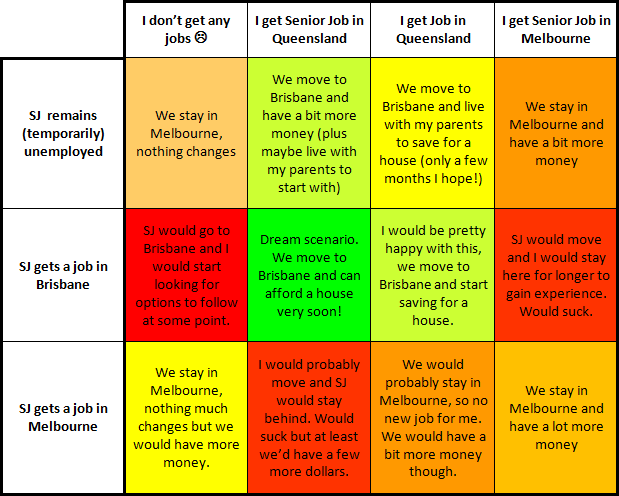 Thanks to my experience in my Melbourne Job I would have no real problem getting the Brisbane Job if I wanted it...I just wasn't sure I did. I went home early that day, I could no longer concentrate on anything and needed to talk to SJ badly about what it all would mean, particularly if he did manage to get a job in Melbourne. By the end of the evening I had made the decision to apply for the Queensland Job and was suddenly grateful for my month by month lease (another long story). After getting back to work the next day and talking to a colleague, I also made the decision to apply for the Senior Job in both Queensland and Victoria (they were listed as one anyway) just in case. Last time a Senior Job was advertised in Queensland they had less than 5 applicants...worth a shot, right? FYI, Senior Job would include a pay rise of about 17% for me if I got it. SJ and I decided to keep this all a secret. My mother would love to have me move back to Brisbane (she frequently tells me she missed me) but I didn't want her getting her hopes up in case it didn't happen. Or worse, in case I got it and SJ got something down here and I turned it down! To makes things 'easy' I've put together a table of what our options look like. So as you can see, we have a lot of options now. I'm still hoping for the dream scenario though. Our weekend in Brisbane for SJ's graduation was the weekend before my applications were due. It was so hard to be home and seeing everyone and not say anything. We could be living in Brisbane in a matter of weeks! While were up there, SJ went and talked to his PhD supervisor about possible work and there is a chance that he'll be able to do a Post-doc up there. We're hoping any day now to hear that funding has been approved and he could leave from that point within days. As for me, I heard last Tuesday that I had the opportunity to interview for the Senior Job positions on Friday. 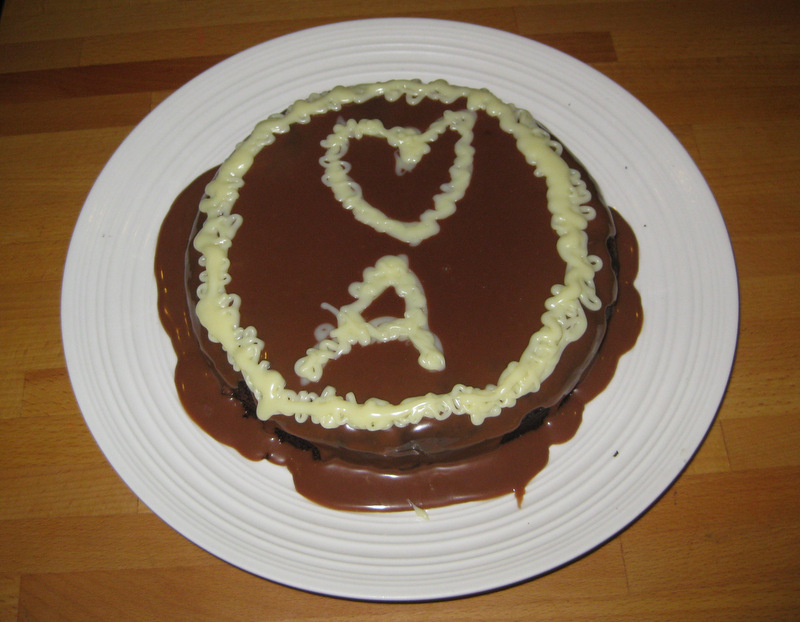 When I got home on Tuesday, SJ had made me this cake to congratulate me on my interview. I'm not sure if it was really for me or if he just wanted an excuse to make some ganache! It was as good as it looks. I did my best not to think too much about it, until Thursday night when I got my outfit together and tried to remain calm....only to check my email...at 9pm I was given a 'package' to study for which I would be given a 'scenario' and asked to provide a 'briefing'...big nerves then. And also why I didn't write this blog post that evening as I intended! So now onto the important things, what did I wear? My most capable outfit of course. 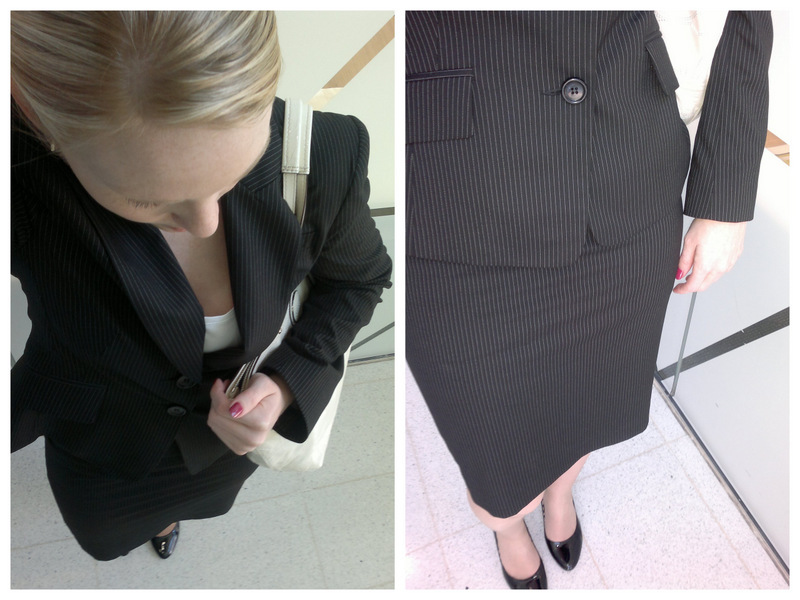 Black pinstripe Cue suit with Peeptoe court shoes. I only wore a white singlet underneath but didn't remove my jacket. I also wore Cutex Mulberry on my fingernails as it seemed less 'aggressive' (SJ's description) than my favourite OPI Big Apple Red. 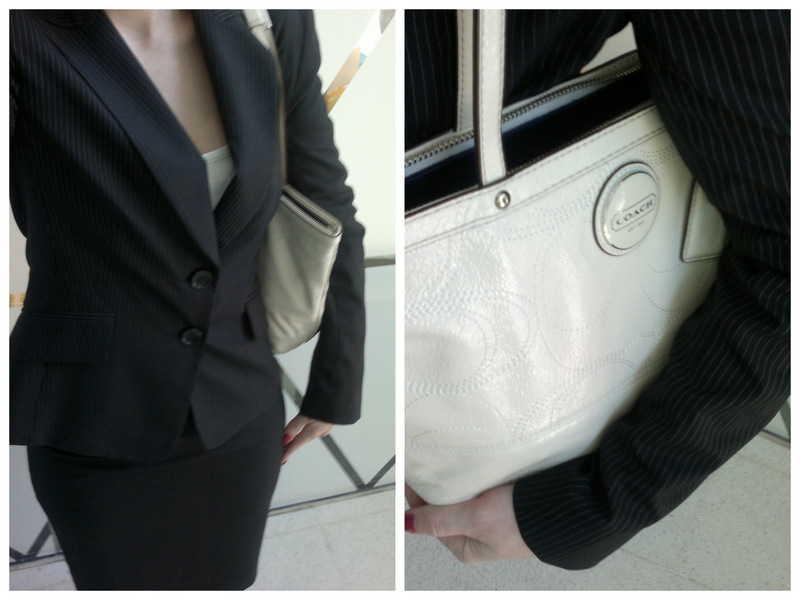 I carried my cream Coach bag and drove to work...I didn't think my suit would travel well if I rode my bike. The interview itself went well...ish. How do you ever really know about these things? I felt I was punching a bit above my weight by applying and was pretty stoked to have been short listed. There are 4 positions of Senior Job going, (1 in QLD, 1 in my office and 2 in Head Office) and originally 30 applicants...the short list was for 10. So my chances are actually pretty decent but that makes it a little worse, now I know that I stand a chance I'm more nervous than when I thought the interview was the peak of my success! I should know the outcomes of this one in 3-4 weeks. I will keep you all updated whenever I hear anything (of course) though I may have to message a few friends who read this blog first (I value my life). Interviews for the Job in Queensland (the one just like the one I have now) should be announced soon too, it's been held back for other reasons. I would still be thrilled with that position, but now I know I stand a chance at the Senior Job up there I want that one so much more. Sorry for the long post, hope it answers any questions. Sorry it's not something super exciting like expecting a baby or an engagement, but getting the job I really want and SJ getting the Post-doc would be right up there with those two things for me. It would really put us in a much better financial position, we'd be able to buy a house within a matter of months and once that happens it brings getting engaged/married and having babies that little bit closer....and when they come around, I will blog in just as much detail! And your outfit gives the impression of smart, capable boss lady, I would definitely hire you! My fingers are crossed for you for any outcome that will make you both happy! I know what it's like waiting to hear job outcomes, it can be super stressful! Best of luck, I hope the dream scenario comes through. Best of luck! I hope you get your dream scenario and look forward to updates! This is super exciting! Fingers and toes crossed!!! Fingers crossed.. that's awesome. YAY but interview outfit looks great. congrats hun thats amazing news! also wanted to say don't put too much pressure on yourself about the whole getting married/baby thing, I know it seems like everyone in the blogosphere is doing it but I guess wedding planning/blogging about babies are things that lend themselves to blogging! You seem (well you look anyway) quite young and have so much ahead of you and there is plenty of time for all of that down the track! you seem really succefful professionally, so congrats! Oooh, we're all wishing for the Dream Scenario for you guys! You looked very capable in your interview attire! I loved your table. So cute. I would probably do that too. Wow! That is awesome stuff still! A better career for both of you,, more money and an interstate move. How can that not be as important as the other things you mentioned? Fingers crossed for you as we await the big decision from your interviews. Love the decision chart! I should start using tools like that to make decision making that much clearer. Best of luck, I LOVE the table. I need to come to you when it comes to making important life decisions.